If Friday’s win over the Denver Nuggets is any indication, this new version of the Philadelphia 76ers might spell trouble for the rest of the Eastern Conference. Coach Brett Brown wasted no time implementing new forward Tobias Harris and showing the NBA the potential of his loaded starting lineup, dubbed the Phantastic 5 by NBA poet laureate Tim Bontemps. It’s crazy to think that a journeyman who has bounced around five teams in his first seven years could make such a difference. But Harris has emerged as a bona fide star in this league. Check this out: There are only nine dudes in the NBA averaging more than 20 points per game with a true shooting percentage over 60: James Harden, Giannis Antetokounmpo, Stephen Curry, Kawhi Leonard, Kyrie Irving, Karl-Anthony Towns, Kevin Durant, Buddy Hield and Harris. Those fellas aren’t journeymen. The guy has been one of the best volume scorers in the league. A quick look at Harris’ shot chart should make Sixers fans swoon. But impressive shot charts and elite shooting stats are only one part of the story. A deeper dive into the fit between Harris and the Sixers reveals a few challenges. Great young NBA players rarely switch teams multiple times. So why has Harris logged so many area codes? Well, he hasn’t been great for long. He has struggled to develop and find his place in the NBA. Harris never thrived in his first three stops, but that changed with the LA Clippers. Doc Rivers and the coaching staff turned Harris loose as a pick-and-roll ball handler. Harris loves to drive left, Doc loves ball screens and the Clippers designed sets that featured Harris attacking defenses from his favorite spots. It was unprecedented. Harris was never featured in pick-and-rolls until this season. Coming into this campaign, Harris never averaged more than 7.8 picks per game, according to Second Spectrum data. But that figure suddenly surged to 17.1 this season, and so did Harris’ star status around the league. Harris arrived in Philadelphia as the fourth-most active ballhandling forward in pick plays this season, but unless Philly suddenly changes its stripes — and unless Jimmy Butler and Ben Simmons suddenly disappear — Harris’ on-ball usage will crater. He’ll derive most of his value in off-ball situations. But fear not, Philly fans, Harris’ off-ball powers will likely shine brighter than ever. He can quickly become one of the most dangerous stretch-4s in the NBA, and his impressive catch-and-shoot abilities from long range are going to be vital on a team desperate for shooting. Aside from JJ Redick, the Sixers’ stars all have one thing in common: They don’t thrive from 3. Butler, Simmons and Joel Embiid combine for just 2.4 3s per game and shoot 33 percent from downtown as a trio. Together, Redick and Harris can deodorize some of that perimeter stank — and bring spacing, to boot. After Butler arrived in November, the Sixers MacGyvered acceptable 3-point offense with role players. Mike Muscala, Landry Shamet and Wilson Chandler represented three of Philly’s top four 3-point shooters following the Butler trade. But those fellas were just sent packing in this Harris deal, meaning that Philly needs to reinvent its perimeter arsenal. Harris will be the centerpiece of that effort. Here we go: Ten multiple-choice questions on the All-Stars and snubs. Shoot your shot. Harris is making an impressive 41.7 percent of his catch-and-shoot tries this season. The Sixers have to exploit that. Brown should pay special attention to the new guy’s corner numbers. You know why? Because among the 86 players who have tried at least 50 corner 3s this season, Harris ranks second in efficiency. He has knocked down an incredible 52.9 percent of his corner looks, second only to Stephen Curry. That’s one reason this Harris acquisition represents a matchup nightmare. Opponents not only have to keep defenders close to Harris on the perimeter, they have to keep a skilled defender close to him. Harris is essentially replacing Chandler as Philly’s starting 4. Chandler can shoot, but he is a statue compared with Harris. Teams used Chandler as a safe space to hide their weaker defenders. That’s where the Boston Celtics stashed Kyrie Irving. But Irving can’t handle Harris. That’s a job for Jaylen Brown or Jayson Tatum. At 6-foot-9 and 235 pounds, Harris is too big, too skilled and too dynamic. The arrival of Harris eliminates all the hiding places for weak defenders. The Celtics have one of the best defenses in the league, but with Harris on board, the Sixers can now hunt mismatches and target weak spots — like, say, Irving or Gordon Hayward — more easily than they could with Chandler in the starting group. 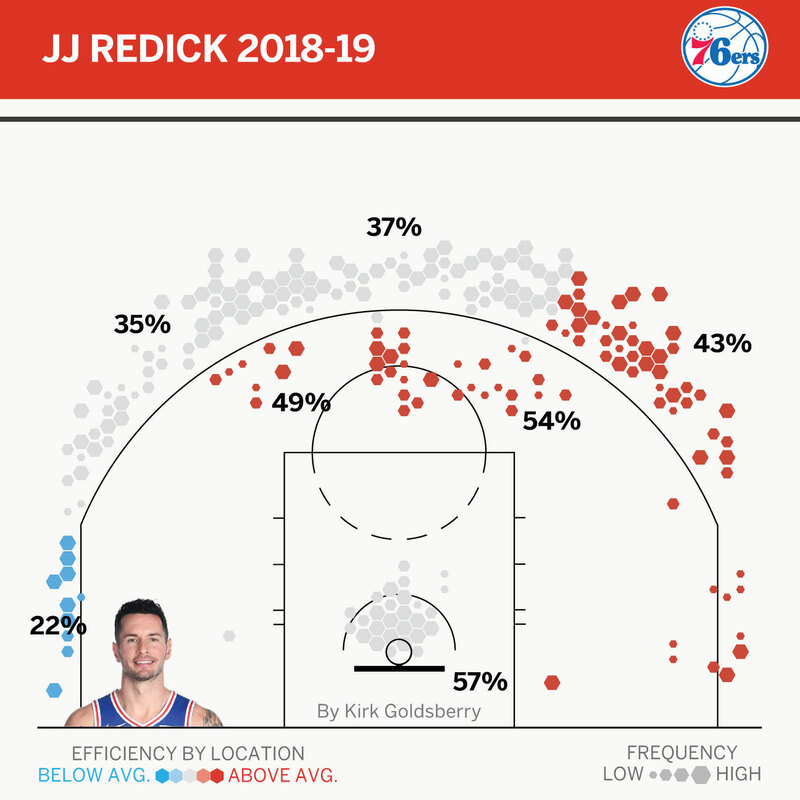 Within the Phantastic 5, Redick is probably the easiest guy to defend — and he’s terrifying, constantly running around, bouncing off screens and turning minor defensive lapses into frightening jump-shooting opportunities. Nobody should be happier about the Harris acquisition than Embiid, whose new frontcourt mate — and the threat of his jumper — will thin out defenses and open up the paint for Philly’s centerpiece. Embiid not only remains the most valuable player on this team, he is beginning to look like the most valuable big man on the planet. Sorry, Brow, but Embiid is the best two-way big in the league, and the numbers prove it. Even after the massive trades, Embiid is far and away the Sixers’ most dominant scorer. Only one Sixer is averaging more than 21 points per game, and it’s Embiid. His 27 PPG is unheard of for a center in the time of pace, space and small ball. The last center to hit that number was Shaquille O’Neal … more than 15 years ago! At just 24, Embiid is averaging career highs in points, rebounds, assists and free throws. He ranks second in the league in free throw attempts behind human foul magnet James Harden. The spacing and dynamic playmaking Harris brings to the table will only make Embiid a bigger problem. Pairing Harris with Embiid immediately creates one of the best frontcourts in the whole league. Both dudes threaten opponents on and off the ball. 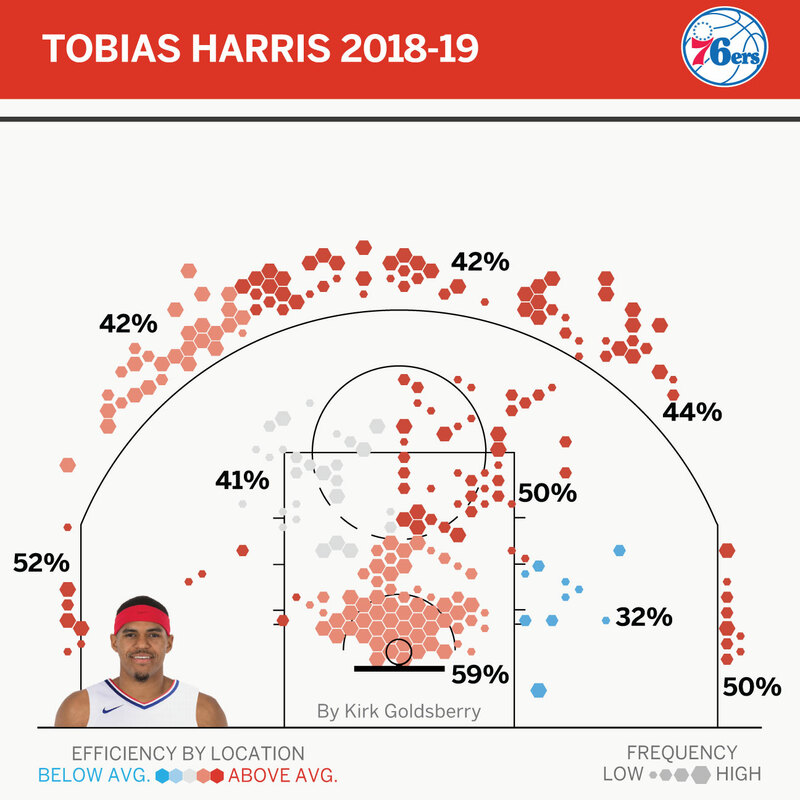 Harris can act as a quintessential stretch-4 or take turns quarterbacking sets, while Embiid’s youthful interior dominance manifests as a post threat and as a putback machine. Embiid already leads the league in tip-ins, and if Harris starts drawing opposing bigs farther from the rim, Embiid’s putback game will get even more dangerous. On defense, it is hard to overstate just how good Embiid has been. He is the best defensive rebounder in the league, and his rim protection numbers make him a Defensive Player of the Year candidate. 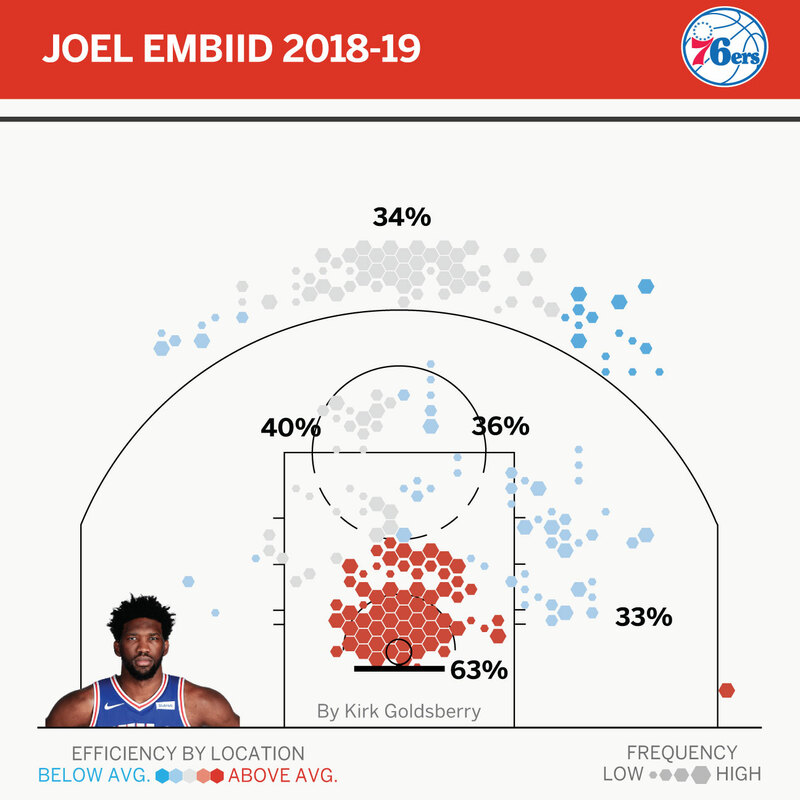 Per Second Spectrum data, Embiid is defending more than 17 shots per game this season (second most in the NBA), and opponents are averaging less than a point per shot against him — a better mark than that of Rudy Gobert. Embiid’s monstrous impact turns the Sixers into an elite defense. When Embiid is on the court, the Sixers’ defensive rating is 102.1, which would be the NBA’s best overall mark this season. When he is off the court, the defense leaks 108.9 points per 100 possessions. On/off stats leave little doubt about who is Philly’s most important player. Since the Butler trade in November, Embiid has the highest on-court net rating on the entire team, and he is the only Sixer with a negative off-court mark. When Embiid is on the court, Philly crushes on both ends. When he is on the bench, the Sixers lose. If Brown can get this all to click in the next few months, the Sixers could enter the playoffs with a scary team. If it all meshes, the Harris acquisition could propel this team to the top of the East. If it doesn’t, Philly will have some tough choices to make this summer. Will the Sixers drop maxes on Butler and Harris? There’s risk no matter what, but the next few months will provide a key glimpse into the long-term future of the Phantastic 5.